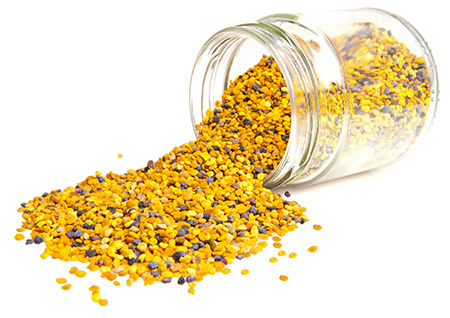 Bee pollen is a known superfood and a favorite among athletes and health professionals. Numerous studies have shown the antibacterial properties of bee pollen against salmonella and some strains of bacteria. Bee pollen can also help reduce addictions, improve vitality, boost the immune system, and regulate digestive activity. There are already many bee pollen supplements in the market today, but I’ve found out that this product is best taken raw and in granule form. All the products below are made by top companies to ensure quality and freshness. I highly recommend adding bee pollen to your daily smoothie or oatmeal for its numerous health benefits and added nutritional value. Why I like it: Stakich Incorporated has been making high-quality and affordable natural products for over 90 years. Their product is guaranteed 100% pure and unprocessed with no additives so you are getting a premium product for a great price. Their bee pollen supplement has never been dried or heated to make sure that all nutrients remain intact. Proper quality control and processing are done because heating can degrade the bioactivity of certain nutrients. 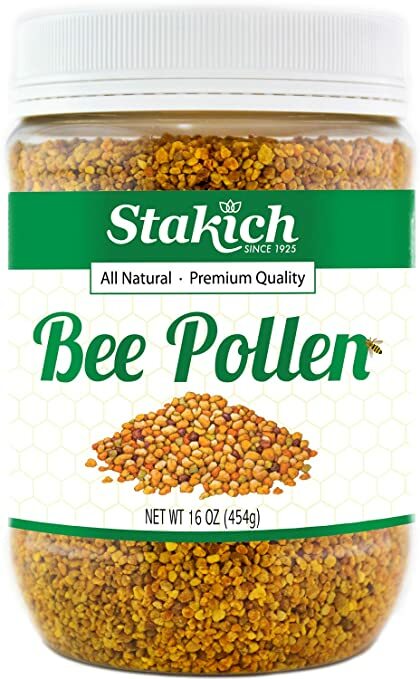 Because the Stakich Bee Pollen Granules is in its raw form, this ensures that all 22 known elements remain preserved. You can be certain that the product is loaded with essential nutrients such as Vitamin B12, Vitamin E, enzymes, and amino acids. Customers who have used this product loved adding it to their smoothies. Give it a try and add more nutrients to your usual smoothie! Why I like it: Y.S. Eco Bee Farms is managed and owned by four generations of beekeepers and is the pioneer in certified organic beekeeping in North America. They have been granted organic certification in 1995. Known for producing organic honey, YS Eco Bee Farms now produces top quality low moisture bee pollen in granule form. Customers love getting this product from Amazon because of their fast shipping. You can also easily contact Y.S. Eco Bee Farms should you have questions about the product. 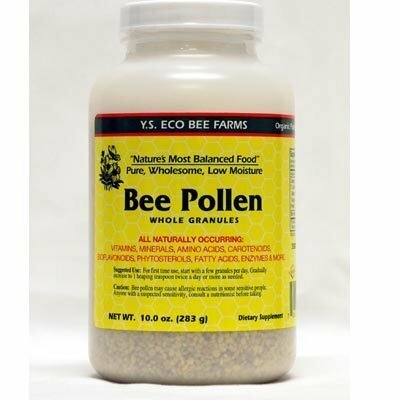 These bee pollen granules dissolve on the tongue and are of good quality. Those who use this product testify of increase in energy levels, stamina and even libido. Users love the taste of the granules once they got used to it. You can also add these low moisture granules to your oatmeal for that added punch! For an affordable price, you can already get two packs of this bee pollen supplement, giving you great value for your money. 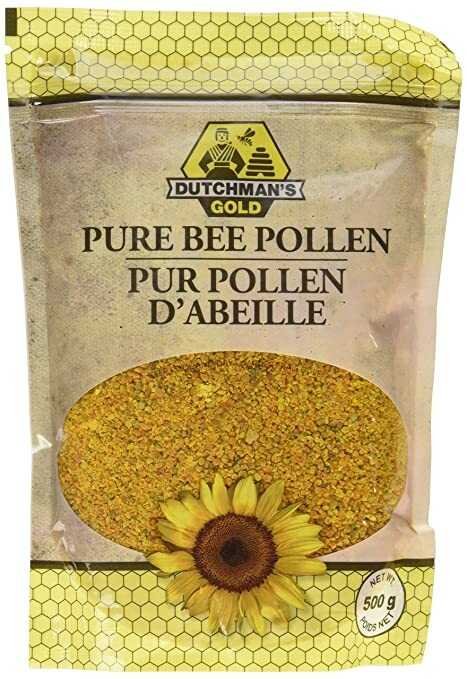 Why I like it: For more than 30 years, Dutchman’s Gold has been offering high-quality pollen sourced from U.S. bees. The company takes pride in their pure bee pollen and guarantees no off-shore fillers and ingredients in their product. The product comes in a large bag and would take more than a month of constant use before it’s consumed. For its volume and price, this is a great buy! Stakich, Y.S. Eco Bee Farms, and Dutchman’s Gold are top brands when it comes to bee pollen supplements. They make fresh and pure bee pollen granules that you can consume raw or added on your smoothie or breakfast oats.